When the US Army’s first astronaut, Col. Woody Spring, spoke at Fort Polk, he urged then-Captain Kihara to apply for the United States Naval Test Pilot School (USNTPS). The first application was unsuccessful, but the Army Aviation Center came looking for Instructor Pilots. 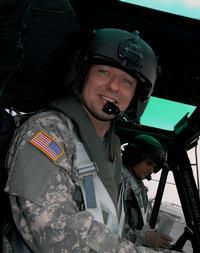 Captain Kihara taught basic combat skills and observers courses in the OH-58 at Fort Rucker from 1988 to 1992, and then moved on to fly scouts in Korea. All the while, test flying remained appealing. “I ended up applying for the USNTPS seven times . . . . I think they got tired of me and said, ‘If this guy is going to apply this many times, maybe we’ll give him a chance.” A pre-TPS course at Edwards Air Force Base led to Patuxent River Naval Air Station in December 1993. An assignment to the Army Aviation Technical Test Center at Fort Rucker morphed into a busy flight test tour at the Bell plant in Arlington, Texas, integrating the OH-58D Kiowa Warrior with the Series 250-C30R/3 engine and Improved Master Control Processing Unit (IMCPU). Col. Kihara says, “I learned a whole lot about software-hardware integration, engine testing, weapons firing, you name it, and lots of it.” Kiowa Warrior tests required autorotations at high gross weights and expanded the lateral center of gravity for weapons. IMCPU integration supported Army digitization experiments with Task Force XXI. Col. Kihara returned to the US to become chief of flight test at AATD 2001. With the start of Operation Enduring Freedom, he helped meet the immediate needs of combat aviators. The AATD Rapid Prototyping Division developed Hellfire launcher modifications that protected Apaches and Kiowa Warriors from missile debris. The Systems Integration Division began work on the Rotorcraft Pilot’s Associate and Manned-Unmanned (MUM) teaming concepts that now enable Apaches to exploit Unmanned Aerial Systems (UASs).